Set in the rolling green countryside of County Wicklow at the base of Sugarloaf Mountain, Powerscourt Estate and Gardens is one of the most iconic country homes in all of Ireland. The imposing Palladian mansion was home to noble families for centuries, before being destroyed by fire and rebuilt in the 20th century. The Viscounts of Powerscourt, for whom the estate is named, created the extensive gardens that are still famous throughout the world today and attract visitors from nearby Dublin. From the waterfall hike to the formal gardens, golf course and even the luxury hotel, here is your complete guide to exploring Powerscourt Estate — one of the top places to visit in Ireland. Powerscourt Estate has traditionally been the home of the Viscounts of Powerscourt — a noble title bestowed upon various high-ranking officials in Ireland since 1618. However, long before the Viscounts began to call the estate home, there was a medieval castle built in the idyllic setting in the 13th century. The building was completely remodeled in the 18th century and turned into a gorgeous Palladian mansion with extensive gardens, including formal Japanese gardens and statue-filled Italian gardens. In 1961, the 11th Viscount of Powerscourt sold his family’s amazing country home to the Slazenger family, who are known in Europe for their impressive sporting goods empire. However, in 1974, a fire destroyed the incredible mansion. The Slazengers still own Powerscourt Estate to this day, and have restored the building and maintained the gardens. Only two rooms of the building are open to the public today, and the rest have been reopened as storefronts. Powerscourt Estate is known for having one of the world’s greatest gardens. The landscaped greens were designed over a 150-year period and remain the highlight of any visit to the estate. In addition to plant life, the gardens are filled with lovely statues and beautiful ironworks. The gardens cover 47 acres and are divided into many different sections, including a rose garden and a kitchen garden, but also includes extensive walks across the property where you can find more than 200 varieties of trees, flowers, and other plants. Due to the tragic fire in 1974, the once-beautiful mansion itself was closed to visitors for many years. It finally reopened in 1996 but it is not as impressive as it once would have been at the height of Powerscourt Estate’s glory. The interiors have been converted into a kind of Irish craft mall, full of small shops selling handmade items from around the country. Even if the original interior has been lost, the Palladian mansion still makes for a postcard-worthy backdrop set amongst the manicured hedges of the garden. After roaming through the green gardens, children will be wowed by Tara’s Museum of Childhood, which includes Ireland’s largest dollhouse and a wide array of perfect, doll-sized furniture and accessories. In addition to the formally designed gardens, the Powerscourt land also includes a wilder area nearby. The Powerscourt waterfall is one of the most beautiful cascades in Ireland. It also Ireland’s tallest waterfall, and flows impressively down a rocky mountainside and is the highest waterfall in the country. The waterfalls and surrounding park are about 4 miles away from the main gardens. The estate grounds are extensive, and those willing to venture away from the gardens will find the Powerscourt Golf Club, which has two 18-hole courses. Visitors can also stop for tea and traditional Irish cooking at the Terrace Café at the main Powerscourt building. 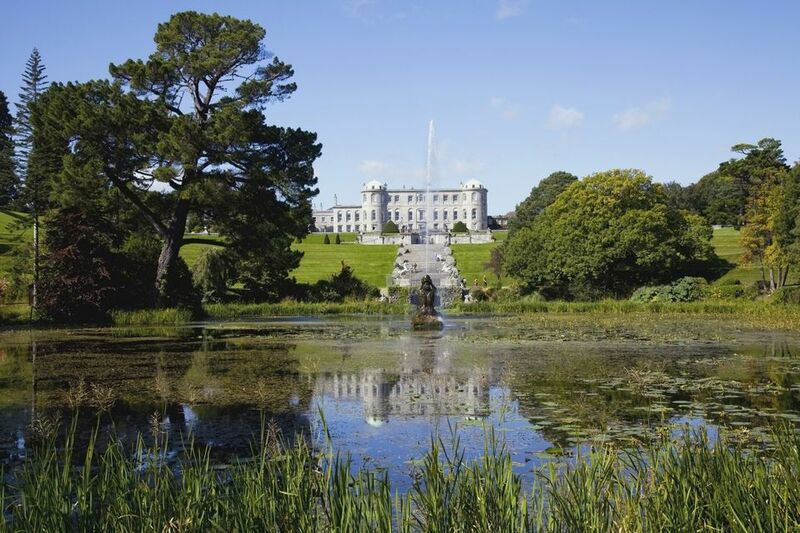 Powerscourt Estate is located just 12 miles (20 kilometers) from downtown Dublin. The location makes for an ideal countryside escape within easy reach of the city center, and many private tour companies can arrange for half-day visits. The estate is found just outside of the Enniskerry village, which can be reached from Dublin via the N11. If you prefer to take public transportation, Enniskerry is connected to Dublin along the 185 bus route. The estate can then be reached on foot from the village. Tickets to the garden can be purchased on the spot for 10 euros. The Powerscourt waterfall and nature park is four miles away and requires a separate entrance fee (6 euros for adults). If you want to experience a leisurely time at the estate, you can also book a room at the Powerscourt Hotel, a 200-room luxury hotel not far from the Powerscourt Waterfall that has a Palladian style inspired by the original manor house. If you are in County Wicklow, then a visit to the Wicklow Mountains is an absolute must. The incredible wilderness area is a short distance from both Dublin and Powerscourt Estate. The Irish national park is full of unspoiled wilderness, as well as major historic sites such as Glendalough.